"Falsely accused. Wrongly imprisoned. He fought for justice to clear his fatherâ€™s name." 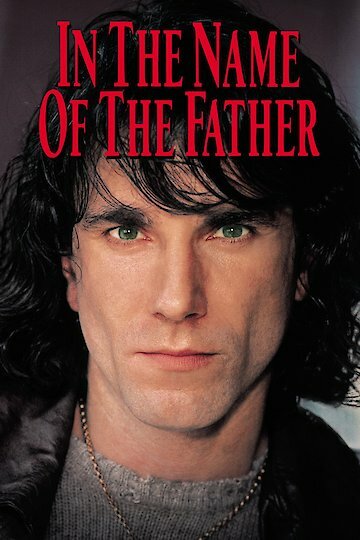 In the Name of the Father is a dramatic film starring Daniel Day Lewis. It is based on a true story. Day Lewis plays Gerry Conlon, a rebellious man growing up in Belfast, Northern Ireland. His parents send him to London in the hopes that he will grow up and learn to stay out of trouble. Their plan backfires as Gerry becomes involved with drugs and prostitutes. There is an explosion in a pub that kills four and people believe Gerry is involved but no one knows how. It turns out that Gerry was robbing the prostitute that lived next door to the pub. Gerry and a couple of his friends are arrested and the police are able to force a confession out of him. Gerry’s family members are also arrested because the police believe that somehow they are involved. The police find bomb making materials in Gerry’s aunt’s house however Gerry and his family suspect that the police planted the evidence. They are all sentenced to life in prison. Gerry is furious. While he is incarcerated, Gerry finds out that the real man behind the bombing is also in the prison. The bomber attacks a prison guard and Gerry saves his life. In the midst of all the prison fighting, Gerry’s father is killed. Gareth is Gerry’s father’s lawyer and she begins to investigate his death. While doing so, she comes across Gerry’s prison files. She discovers that the police were hiding information from Gerry’s defense attorneys. Gareth shows these documents to the judge who orders the release of Gerry and his family. The whole family is cleared of any wrongdoing. Gerry decides that he must sell his story and make sure his father’s name and reputation are cleared. In the Name of the Father is currently available to watch and stream, download, buy on demand at HBO NOW, Amazon, Vudu, Google Play, iTunes, YouTube VOD online.